My life has always revolved around more than one language, at least ever since I could remember. I have had to manage 3 languages in my daily life for about 10 years now, and that is actually more normal than it may seem to you. To orientate you: I was born in Taiwan, but then moved to Peru before I was 2 years old, and have been living here ever since. My mother tongue is Mandarin Chinese, and that’s the language in which I came to know this world. My attempts to get fluent in Chinese writing when I was younger all became futile when I didn’t keep up the regime as I grew older. So one would probably call me illiterate if I went back to Taiwan and tried to read a random text. But conversational Chinese just comes ‘naturally’ to me. I don’t understand the lexis and sentence structure of most of what I say – I just know, so I’m lucky to have been able to maintain this language. My second, but also native, language is Spanish. I can’t remember how I started learning Spanish, but I do remember that it was quite confusing at the beginning. The differences in tones and pronunciation befuddled the hell out of the child that I was. There are still syllables that I can’t say properly, such as the “rr” (double r”), which is used in common words such as “perro” (dog) and “carro” (car). I can only pronounce them (incorrectly) as if they were made of just one “r”. My early education was dictated completely in Spanish, so I can confidently call myself fluent in this language. My third language is English. I didn’t learn this language until I was in 3rd grade, when I switched to a bilingual school. This change was one of the most painful social experiences of my childhood, but – as you can see now – it was completely worth it. My school teaches most of its classes in English, and most teachers are native in English, so my level became quite good. Additionally, I love reading (duh). That’s how I got through 3rd grade – finishing a book in English pretty much every day. Needless to say, I got through quite a lot of books (many of them series). You can read about them here. Ever since 3rd grade, my daily life has consisted of 3 languages. At home, I communicate with my family in Chinese. At school, I talk with my friends in Spanish. In most classes, my thought-process switches to English. The settings have changed, as I’m no longer in school, but the languages haven’t. I still talk to my parents in Chinese, converse or chat with my friends mostly in Spanish, and do everything else (read, write, etc.) in English. 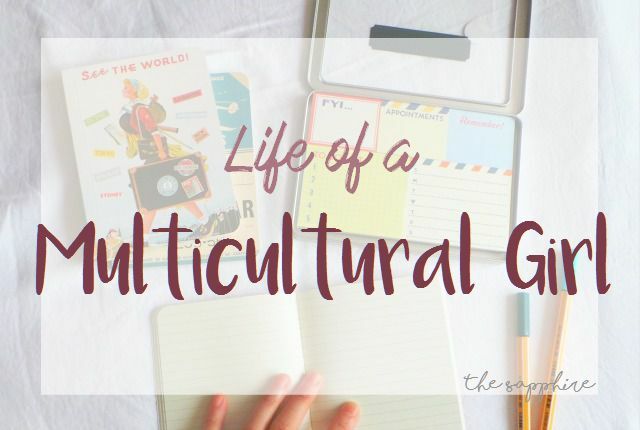 Because of my multicultural situation, I have never been fully able to identify with any one culture whatsoever. I look Taiwanese and I speak Chinese, but I’m not Taiwanese. I still remember when I visited Taiwan several years ago, and attended an abacus (math) class. I must have been about 8 years old. I believe another student asked me where I was from, because I didn’t look Taiwanese. Even though my entire family is Chinese-Taiwanese. I assume it was either of my a) slightly darker skin color, or b) my accent that I didn’t (don’t) know I have. In Peru, well, you just have to look at me to know that I’m definitely not Peruvian. People have occasionally commented that I have some accent when I speak Spanish, but if you ask me though, I will completely deny it. My Spanish is *flawless*, okay? As for English, it’s a complicated relationship. I’ve never lived in a Western country (yet), and I don’t have any ties to the Western world, but it’s ironically the language and culture that I feel I know best. I literally think, read and write in English every day, and have done so for years. Because of the books that I have studied and read, I understand the Western culture better than my two other languages and cultures; though the books that I have read have also enabled me to expand my knowledge globally. In high school, I decided to learn the Peruvian Sign Language, just out of curiosity. And it became an activity that I continued to work on, even today. I’m nowhere near proficient in sign language, simply because I haven’t had the greatest motivation to do so, nor much resources to learn on my own. However, I’m now learning American Sign Language (ASL) online on a website called ASLU, and I’m giving it my all to reach some level of proficiency before I go to university next year. If you aren’t familiar with sign language, you must know that a country’s sign language is a completely different language to that country’s spoken language, and it’s different for every country. America has ASL; the UK has BSL (British Sign Language). It’s quite complicated, but it really is a wonderful world once you go into it. I have also realized (about time!) that I am actually genuinely passionate about languages and how they relate to each other. This year, I tried out learning a bit of German every day (on Duolingo) for about 7-8 months, before realizing that I needed to invest more time in it. Without proper motivation, I switched to Italian about 1-2 months ago, and I have been loving it ever since. Because Italian is a Romance language – the same language family as English and Spanish – I can already understand some things. Italian is a beautiful language, and I believe that learning it will help me understand where my two other Romance languages are coming from, and maybe even expand my vocabulary more. I used to see language as one separate thing. But if there’s one thing I have learned this year, it’s that it’s all connected. These (spoken and signed) languages can teach you so much about their respective cultures and origins, and it’s amazing how much knowledge you can gain from learning a new language and maintaining those that you know already. So that’s what I’m going to do! I’m very poor with languages. I envy you your versatility. It must provide a richness of experience. I love this so much! It’s amazing that you’ve had such a diverse education in languages 🙂 I speak Spanish and English with native fluency too and right now I’ve been studying French for about 4 years so I really hope one day I’ll reach a high-enough level of fluency that I could live without a problem in a French-speaking country (or at least enjoy the literature). Sign language is so awesome! I was really interested in learning ASL when I was about 8 but I never continued and it’s a shame but maybe I’ll try again at some point. That’s the sad thing about sign language… people seem fascinated by sign language and the Deaf community, but rarely does anyone try to learn the language unless a family member or friend is deaf 🙁 It demotivated me at times, though, but I have learned sooo much through sign language – how to become more expressive with your body, how a community thrives without talking, etc. Exactlyy. The fact that being deaf is seeing as a ‘disability’ by us (the hearing), we rarely get involved unless we know someone who has that ‘difficulty’. And because they are all so scattered across each country, their voice does not reach out to many of us. Thank you for your response, though 🙂 You’re very encouraging, and it’s wonderful that you’re multilingual + multicultural too! This was very interesting to read. That’s wonderful that you can speak several languages! I grew up learning Mandarin Chinese first as well. When I go back to Taiwan, I am also asked where I’m from time to time, as most Taiwanese people can sort of tell if you grew up in a western country. Great post!